Maui Vista - Best Resort, Best Building, Floor & View! FOR LATE APRIL AND MAY! The ocean view from this condo is so stunning that you can see the ocean while standing at the cooktop. The kitchen was remodeled from the original, and has a ceiling fan, slide-out shelving in the lower cabinets, and a large refrigerator with an ice-maker. We have all the appliances you might need, including a blender for those slushy tropical drinks, a coffee-maker, a toaster, and an iron. The stacked washer/dryer is hidden behind accordion doors to the left of the kitchen sink. 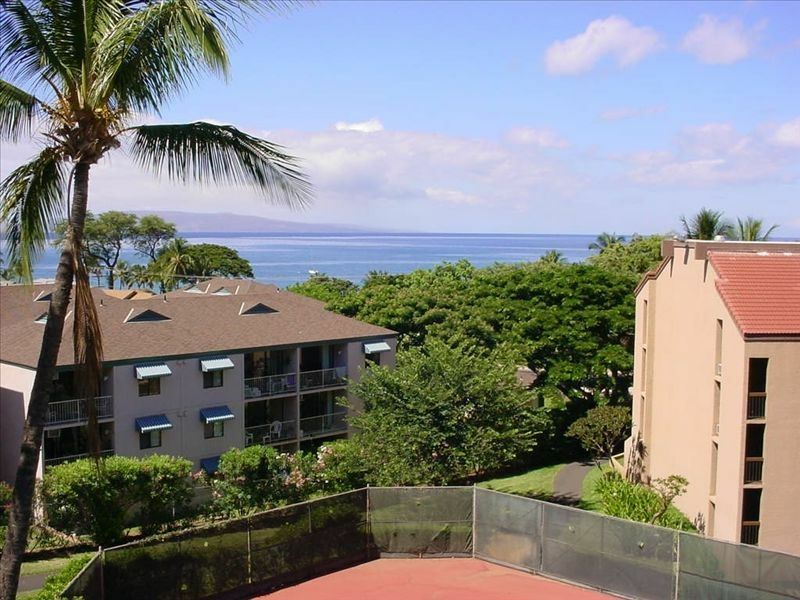 Maui Vista is the best resort because of its convenient location across from Charley Young Beach and within easy walking distance of shopping and dining. Resorts further north are too far from the nicest beaches of South Maui, while those further south are too far from grocery stores and the affordable shops and restaurants of Central Kihei. Our unit is on the ocean-facing side of the fourth floor (top floor) of Building 2. Building 2 is the best building because it is not so close to the traffic noise, but still close enough to the ocean to hear the surf at night. Our condo is comfortably furnished, and both bedrooms have ceiling fans. Great 2 night stay. Owner allowed late check out at no charge .. dated furniture and beds and especially hide a bed need updating ! This 4th floor 2-bedroom unit had a great view of the ocean from the lanai. The pool and tennis courts could also be easily seen, so we could watch our kids play in the pool and tennis courts from the lanai. It was also just right across the street from Charlie Young Beach. Not only did the condo have everything we needed to cook and sleep, it had beach chairs, bamboo mats, sun umbrella, boogie boards, and some fins (no masks and snorkels though). The second bedroom is in the loft, so bring earplugs if someone in your party gets up early and is noisy in the mornings. There is only one window air conditioner installed in the lanai side of unit, so the downstairs back master bedroom got a bit warm if the bedroom door was not left open. Debbie (the local property manager) was very helpful with any of our concerns. We had a great time and would stay here again. Great view, low noise, good beach access, and value make up for deferred maintenance in unit. We were 2 couples and 2 kids that wanted to boogie board and snorkle. This place was a great spot, though a bit tight on space for 6 and a bit worn around the edges. Good Value food nearby: the pork belly phad thai dish at 'Ami 'ami next door or the NY strip at ABC Deli. George and Barbara are absolutely awesome guests! You won't even have to clean after they leave. Come again any time! We loved this unit, Everything was as expected. Great location to the beach and unit provided all beach equipment. The view is spectacular . The communication with the owners was great. Lovely, relaxing ideal place to stay. Maui Vista is an ideal way to experience Maui. The grounds are well maintained and have many mature monkeypod trees along with flowering shrubs. Each building has their own swimming pool. For us the best part was only a block walk from one of the best beaches on Maui. Our unit was comfortable and well stocked. Departure cleaning is charged on stays less than five nights.